Veterans Day is November 11th. Assemblies are a great option for fulfilling requirements to observe Veterans Day. To create an observance that truly helps students understand the meaning and significance of Veterans Day, prepare your student by provoking their curiosity and helping them grow their knowledge about Veterans Day and veterans' issues before the day of the assembly. You can find fresh instructional approaches to teaching about Veterans Day with resources from INFOhio. Step one: Go to Educator Tools to find instructional strategies, lesson plans, and more. Educator Tools, powered by INFOhio, now includes more than 50,000 teacher-approved lesson plans, assessments, and other instructional materials, curated by Knovation, to support personalized learning, project-based learning, and the inquiry process. In INFOhio’s Educator Tools, you'll find the best-in-class learning resources for all grades, all subject areas, and all learning resource types to differentiate and personalize learning for your Ohio PreK-12 students. Step Two: Go to ISearch to find digital texts, videos, images, and more that you can print or upload to your learning management system for student use. Results will come from nearly all of INFOhio's content providers—World Book, EBSCO, Scholastic, and more. ISearch also gives you results from your school library and the Digital Video Collection, providing you with a variety of content in a variety of media formats to challenge and engage students. What do the two steps look like when it comes to Veterans Day? Try a search for Veterans Day in Educator Tools. If you need to narrow your results, click the category limiter on the left to expand your limiter options and then check the box next to the limiter you want to apply. To learn more about any of the resources in your results list, click the More Info button, or i-button, in the upper right corner of a resource box. From a resource More Info page, you can find the learning standards to which that resource has been aligned and a button you can use that will give you a permanent link to save the resources to your learning management system. This particular Veterans Day resource links to an interactive Veterans Day vocabulary matching activity. That's a fun way to work on vocabulary related to Veterans and patriotism, but you might need to find some texts and videos that use those words in context before your students try to complete the activity. Hold that thought! We'll get you those texts and videos in step two. As you find results in Educator Tools that you want to save, click the heart in the lower left corner of the item in the result list. The heart will turn green and will be saved to your session favorites. When you are ready to email your session favorites to yourself, click the heart button with the number of favorites you've saved next to the search bar. From there, you can send permanent links to the resources to yourself. Remember to email your favorites to yourself at the end of each session as favorites are stored for a single session only. If you need more instructions on using Educator Tools, watch the INFOhio video tutorial, Getting Started with Educator Tools. Now we're ready for our second step, ISearch. You can use ISearch to find texts and videos that will introduce your students to the vocabulary they'll see in the Educator Tools activity you've saved. In ISearch, try a search for "Veterans Day" using quotation marks around your search phrase. That tells ISearch that you want to search for that exact phrase. If you are logged into the INFOhio website with your school username and password when you search ISearch, you will probably land on a My Library tab. That tab will include any results from your school library along with videos from INFOhio's Digital Video Collection and eBooks in the INFOhio eBook collection. If you are logged into the INFOhio website as a Statewide User, you'll get an eBooks & Videos tab. It includes videos from INFOhio's Digital Video Collection and eBooks in the INFOhio eBook collection. A perennially favorite video around this time year is "The Sharp Wits in What is Veteran's Day?" Click the "Full Program" link. You can download or stream the video for your students. Next, explore your results on the Encyclopedias tab. The Encyclopedia articles that appear in these results are from academic, trustworthy encyclopedia publishers. You don't have to worry about getting Wikipedia articles in ISearch! The first result you find will usually be a Research Starter. Click the title of the Research Starter to read the full text of that encyclopedia article. To view the full text of any of the other encyclopedia articles, click the View/Download button. Next, explore the results on the Basic Sources tab. Those results tend to be at a lower Lexile or reading level. To get to the full text of an article, click the View/Download button. In this case, we'll be viewing the full text for "Happy Veterans Day!" that appeared in Scholastic News. When you view the detailed record for an item in ISearch, you'll usually find your options for viewing the full text along the left side of the screen and your options for saving, citing, listening, and translating along the right side of the screen. For this article I will take a look at the HTML Full Text and the PDF Full Text. When you view the HTML Full Text, you'll find some excellent tools to support multiple learning types and needs. For example, struggling readers may like to hear the article read aloud as they follow along. You can click the play button to hear the article, but, first, click that gear icon. On the box that appears, turn on "Enhanced text visibility." Now when you click the play button for the read aloud, the text appears much larger in a box near the bottom of the screen. To help your students have an authentic reading experience, provide them with the link to the PDF version of the full text as well. This will let students see the images and read the article, viewing it exactly as it originally appeared in print. For older students, give them texts about the history of Veterans Day, but also let them research some issues related to veterans. You can find results at a higher reading level on the Advanced Sources tab. Consider changing your search to veterans. This will give you lots more results about all aspects of veterans issues. 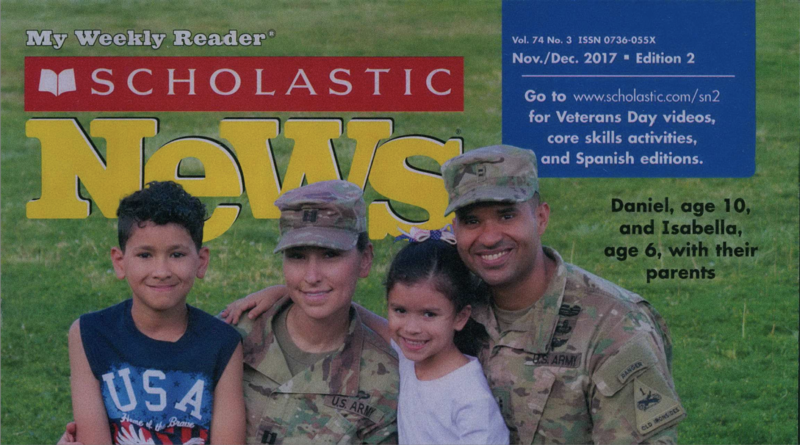 Help students find an article that interests them and helps them think about veterans' experiences in new ways. For example, a student who has a relative finishing their military service and returning home to begin a new career may want to explore how employers go about hiring veterans. Again, options for viewing the full text are available on the left side of the screen. In this case, I've clicked the PDF Full Text link to see the article as it originally appeared in the print November/December 2018 issue of the journal "Workforce." A great database for looking at opposing viewpoints or different perspectives about at topic is Points of View Reference Center. In ISearch, you can narrow the results on the Advanced Sources tab to items from that databases by scrolling to the Content Provider limiter along the left side, clicking View All, and then clicking Points of View Reference Center. The articles you and your students will find from Points of View Reference Center are great for high school students. Points of View Reference Center often provides an Overview, a Point, and a Counterpoint article about an issue. Use the Google Classroom link on the right side of the screen to save the article to your Google Classroom. Not a Google school? No problem! Click the Permalink button to get a link that you can save to any learning management system. The permalink URL includes an authentication string that will allow you and your students to return to that article without having to log in again. Make your Veterans Day observances more meaningful by preparing students to think about Veterans Day and veterans' issues before you watch a video or attend an assembly. Try these two steps to find instructional materials that provoke student curiosity. Share how the two steps work for you on social media using #INFOhioWorks.